My mom moved into sunrise at Wood Ranch. They're wonderful people, but she's not thrilled with the food. They help her with bathing, get her dressed, give her medicine, and they get her to bed. They're very thorough. Sunrise at Wood Ranch was a very nice place but too expensive for us. It seemed very pleasant, and the staff was very nice, efficient, and helpful. I wasn't as impressed with Sunrise at Wood Ranch. It seems older and doesn't have quite as modernized furnishings. We had lunch there, and I was not that impressed. There aren't any grounds that I could look at, just some plants out front. Sunrise was very nice, just too expensive. It’s a beautiful place. I went to the main floor and talked to a counselor there. I did not go to any of the rooms. There is nothing I can say that’s wrong. The location is fine too. It is very friendly, very pretty, and very nice. The people are nice. Sunrise at Wood Ranch was our first choice if we were going to move forward. It was a very nice place. The people were really nice and they had a lot of different options. They had a transitional program for when you’re going from regular care to memory care. They had an in-between memory care which was nice and new because that’s where my grandmother would be and they had a lot of programs. We went into each facility and the memory care didn’t seem like a lockdown hospital setting. We sat and talked with the lady that ran the place for probably an hour and a half and we were totally impressed. We found Sunrise at Wood Ranch for my husband. I like the care that they give and the facility is also quite nice-looking. The environment is very nice and very clean without a smell. The staff is extremely friendly, helpful, and so nice. They’re very good. However, it is so expensive. My relative is in Sunrise at Wood Ranch for almost two months now. It is wonderful. It is five-stars. Everything is great. The food is great, the people are great, and the room is great. It is adequate. The dining set up is good. They have activities like bingo, outings, flower planting, card games, board games, and movies. It impresses me that the people who live there are happy. I've researched and visited all of the assisted living places in both Simi Valley and Thousand Oaks. I found that Sunrise was by far the best. There is no hard sell here, like the other places we visited. The places sells itself. It is the kind of place I would like to go when I hit those years. The key factors that sold me on Sunrise: The staff is all very amicable and friendly to all of its occupants. The decor feels as if you are at a five star hotel/B&B. Cleanliness, they are very picky about maintaining both the inside and outside appearance, to include residents rooms. There is no smell; I found other places having that hospital/old people smell; this place does not. The only drawback is the cost; it is on the high-end of the scale. But this place was on the low-end side when comparing with the other establishments. Happy hunting. Sunrise was a very nice place. It had very nice and helpful staff. They were great, and I liked it. I also liked all the programs they had. However, it was too far from LA County. I settled my husband at Sunrise, and I have nothing but good to say about them. It is very close to my house, so I can go there frequently. It is very homey. When you go in the front door, there is the lobby and a concierge. They have a large room on the left that has couches, a TV, and a fireplace. You can have the privacy of that room if you want, and it's nice. All of the workers are extremely kind, very thoughtful, and everybody's full concern is towards the safety and well-being of the residents. In my experience, they will do almost anything it takes to keep their people safe and well taken care of. It seems like a genuine caring, not just artificial smiles for publicity. There was one incident when my husband fell completely asleep and he slid down out of the chair and onto the floor. They called me right away. They said, "He didn't get hurt. He is fine. We want you to know that there has been an incident that occurred." I appreciate that they keep me posted. They also have a dentist who comes in and takes care of their teeth. My husband lost a crown on his tooth a week or two ago, and today the dentist himself called me and told me that he has been there, and told me what they resolved to do. My husband, at one point, had a male roommate who did create some small problems; they immediate arranged to change him out, and now my husband has the room for himself for the rest of that period. They are really good about taking care of their people. The rooms are nice and kept really clean with lots of storage. They have a shared bathroom, but these are immaculate. I have eaten dinner there three or four times, and the food is wonderful and really good. The people have a choice of two salads, then two different entrées, and two sandwiches. They have dessert. They also have snacks for them. They have nice little things going on. They run their own shuttle or van with the people and take them shopping or take them out for lunch, if they have a little gathering. If I have the money, I will move in there myself. We loved it at Sunrise. That was our second choice. It's just the rooms were too small. The staff and the facilities were wonderful and great and the food was good. Sunrise at Wood Ranch is marvelous. They have separate communities and neighborhoods for different disabilities or different weaknesses that the elderly have. They have exceptional food. I can't say enough good things about it. It's an incredible, loving, encouraging place. They try to incorporate the families to participate in the care of their elderly by providing activities that encourage the whole family. They seem to think of every detail to make it the most wonderful residence. We think Sunrise at Wood Ranch is the most suitable for my mother-in-law. The residents looked very engaged. The amenities seemed very proper. It is also five minutes from our home. They showed us the meal plan and there was plenty of food there. They also had assisted living. They had somebody there participating with throwing a beach ball, and they have coloring. They had lots of activities. Sunrise at Wood Ranch is nice and very homey. People were very nice even the residents. One thing we liked about this place that the other community did not have was that they had a dining area that you could close off just like your formal living room. There is a fireplace there; that's very nice. My mother moved into the memory care of Sunrise at Wood Ranch. The staff is very engaging, very nice, and helpful. I had dinner and lunch there; the food is good, chef prepared, and includes seafood, chicken, and sandwiches. Toiletries are provided, except for shampoos, plus laundry, housekeeping, and meals and drinks. They really have their eyes on my mom, and they placed a bracelet that will sound off whenever she is close to the door; they asked our permission for that. 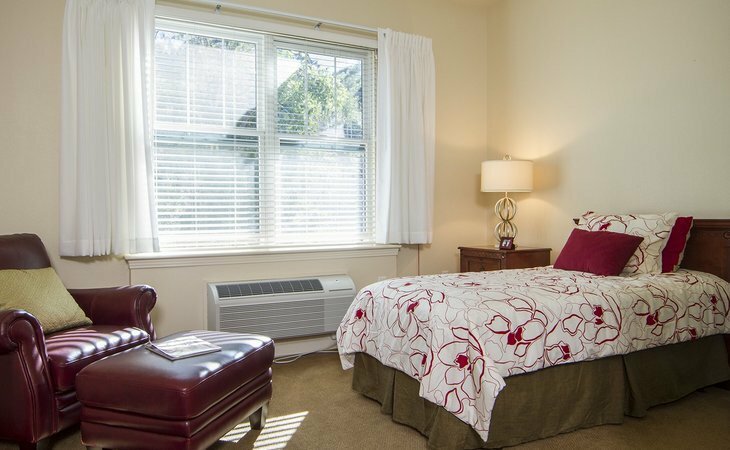 Step into a Sunrise Assisted Living community and you can't help but feel at home. We stop at nothing to make your experience warm and inviting, from our homelike exterior architecture, to our comfortable community areas and choice of suites, to our exceptional outdoor gardens and landscaping. Look around and you?ll notice fresh flowers throughout the residence, and you may even spot our dog or our cat. And of course, there are always the friendly, smiling faces of our staff to ensure that each day spent here is a welcome one. What should caregivers and potential residents know about Sunrise at Wood Ranch?